Why are you bringing up old stuff? Former training partners, Wanderlei Silva and UFC middleweight champion Anderson Silva, are willing to put their one-time friendship aside in order to settle their differences inside the Octagon. Wanderlei, who dominated the 205-pound division just a few years back, recently decided to make the move down to the middleweight division. In preparation for the drop, he will be meeting former UFC champ Rich Franklin in a catch-weight bout of 195-pounds at UFC 99. Last week, Anderson took exception to his former training mate’s career move, calling it “pretentious.” He also wondered why Wanderlei would want to do that to himself. “How much do you weigh? So why are you going to get yourself in trouble?” Anderson asked of Wanderlei. The former PrideFC champion has fired back at Anderson, and he claims that it’s time for war. 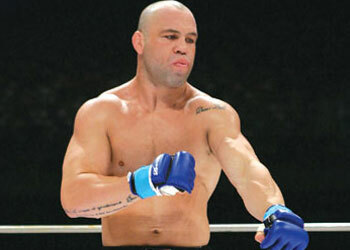 “He is too cocky,” Wanderlei stated. “I hope he can read this. … I never talked anything bad about him; I always respected him. He has always been my friend, always respected me, but now he came with that statement. I can’t understand that. I didn’t come down to 185 to face him. Actually I didn’t have that intention. … Changing divisions and fighting the champion would be too pretentious. I should have to have many fights before facing him, but concerning his last statements, I think the way is open and the war is declared. Although Wanderlei’s drop to 185 was made more out of necessity rather than his desire to scrap for the “The Spider’s” title, it appears he already has the division’s king looking over his shoulder. Once known as MMA’s best finisher, “The Axe Murder” has dropped four out of his last five, forcing many to wonder if he is finished. So what makes him think he can best one of MMA’s top P4P fighters? Certainly not anything Wanderlei did, or didn’t do, to Anderson in training back in the day. Wanderlei’s fire burned a little bit brighter after witnessing Anderson put on his second consecutive disappointing UFC performance this past weekend at UFC 97. Perhaps Wandy will step in at just the right time to hand Anderson his first Octagon L.